My parents were in town for an extended Memorial Day weekend. So the Tuesday after Memorial Day, Linda and I decided to spend a day with them in Santa Cruz. 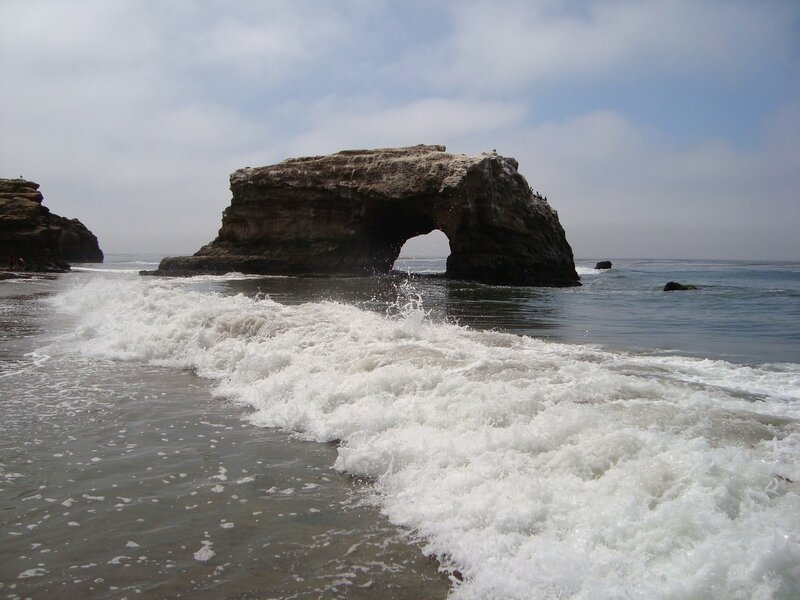 First stop, Natural Bridges State Beach. There is something restorative about standing on the beach in cold, ankle deep water as the waves crash and recede in front of you. Periodically, squadrons of pelicans glided overhead, looking for fish. A sea lion would poke its head out to look around now and then. And the Natural Bridge rock formation loomed over the entire scene. Afterwards, we headed over to Santa Cruz Mountain Brewing, (SCMB) about a five minute drive from the beach. In addition to their small brewery where they make exclusively organic beer, they have a tap room where one can go in and enjoy some of their beer. I was hoping for the best, and slightly fearing the worst. I’ve enjoyed their beer many times, but have noticed some batch to batch variation in their product. And sometimes, this results in off-flavors in the beer. In fairness to SCMB, organic barley and hops are usually inferior to the non-organic kind, and its a testament to the skill of the brewers at SCMB that they produce plenty of good batches of beer. Still, I was hoping we’d spend the time in the SCMB tap room talking about the good times we just had at Natural Bridges, rather than talking about strange flavors lurking in our brew. Mom tends to favor lagers, with her favorites being Heineken and Stella Artois. SCMB wasn’t offering a lager, so I asked the bartender to pour a sample glass of their Wilder Wheat. I braced myself and took a small sip. Good news! I tasted a really soft tasting beer with warm clove and vanilla notes in it. Really nice, and none of the sour, off-notes I had detected in a previous batch of this beer. I handed the glass over for Mom to try. She liked it, being so sure that this was the beer for her, she had no choice but to order it, end of story. Well, not exactly. Mom looked hard at the descriptions of the beers and the wall, and started looking confused. Walking up to the bartender, she asked him what would be comparable to her favorites. The bartender was a lot more patient with Mom than me. Actually, just about everyone is more patient with Mom than me. Mom ended up ordering their Pale Ale on the bartender’s recommendation and really enjoyed it. Dad and I decided to get the spring seasonal, a dry hopped Pale Ale. I forget what hops they used, but the dry-hopping gave the Pale Ale an extra fresh, bitter, and slightly astringent dimension. Falling back upon absolutely zero beer judging and culinary descriptive experience, I’d say it made the beer taste “springy”. Linda decided to get a sampler flight, which she shared with me. SCMB beers tend to be on the lighter side for each style, but don’t seem watery. They’re just the sort of refreshing, yet substantial beer you’d want to drink after a day of surfing. (Or running, because I can’t really speak for surfers, having never surfed.) I’ve been a fan of their Devout Stout, Dread Brown Ale, and People’s Porter for a while now. And every beer on the sampler flight was solid to good. Really pleased to see a local brewery get it so right. 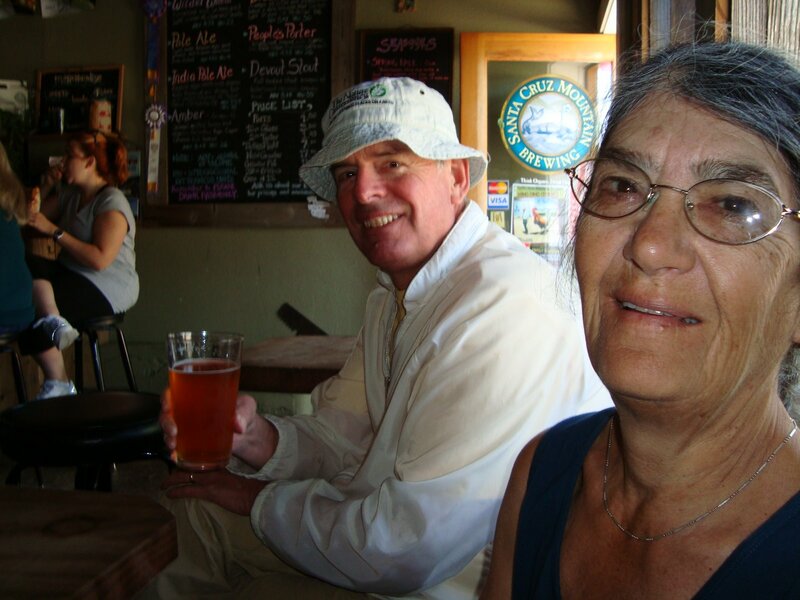 And since Mother’s Day just past, and Father’s Day is around the corner, let me take this opportunity to give a Beer Runner toast to my parents. Growing up in Bowling Green, Ohio in the 70’s, Dad would carefully dole out sips of Rolling Rock to me from his glass on hot summer days, teaching me to “respect beer” at an early age. (This was back when Rolling Rock was a respectable regional brewery, not the soul-less InBev product it is today.) And my running career started out back in 1980, when Dad and I trained for a 10 kilometer race. Dad’s been running well into his 60’s, but it looks like some foot surgeries he’s had to undergo will cause him to hang up the running shoes. Mom also played her part in bringing up her little Beer Runner, and has always been active walking, biking and swimming. Often, Mom would be out swimming in the freezing cold lake or ocean water on family vacations, teaching me that you can have a lot of fun if you develop a high enough pain threshold. And she taught me to put good stuff inside my body, telling me to eat my vegetables because they say “Hi” to my insides. Good beer says “Hi” to your insides.